Alyssa Nader is a volunteer with Rattie Ratz Rescue in the bay area of California. Each month KRL will be featuring at least one animal rescue adventure story, and every other month there will be one from Rattie Ratz. Fantasia (right) and her sister Eunice (left). Fantasia has always been a friendly and happy rat. I will always remember when I picked her up from her foster home and she clung to my chest, staring up at me while I petted her. She has continued to be my most social and loving pet and enjoys meeting people when they come over. She still loves to cuddle and buries her head into us get optimal pats. Unlike her predecessor, Bitey, Fantasia is not a working girl. She does not like coming to my office much and prefers a life of luxury at home. Another thing that she does not like is raw vegetables, which she expresses by throwing said veggies out of her cage. Fantasia has poor survival instincts, as she likes us to “pet” her with the soles of our feet, and never tries to escape being stepped on. She may improve her wild instincts, as we’re practicing her a new hobby – going out on a leash. Fantasia mostly explores bushes and tall grass near our house. Fantasia and her sister Eunice were my first female rats, after having four males. There are some differences between males and females, although rats’ behavior depends greatly on the individual. Females are generally considered to me more active and curious, which makes them interesting, entertaining and great students for training. 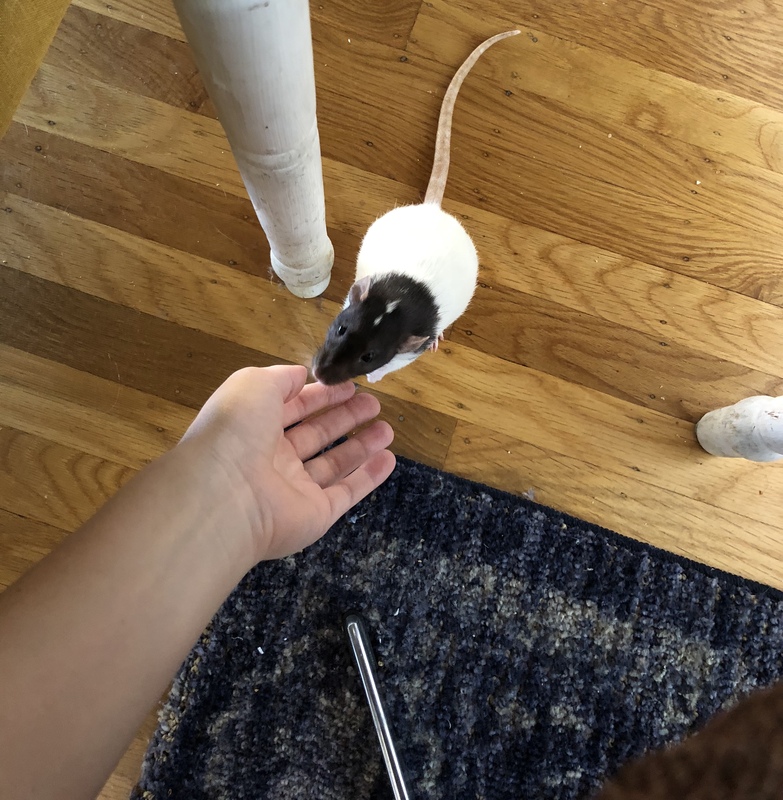 Most impressive rat tricks one sees are performed by female ratties. 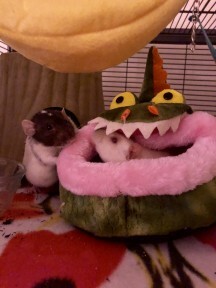 Our favorite trick is destroying our cuddle house as quickly as possible. 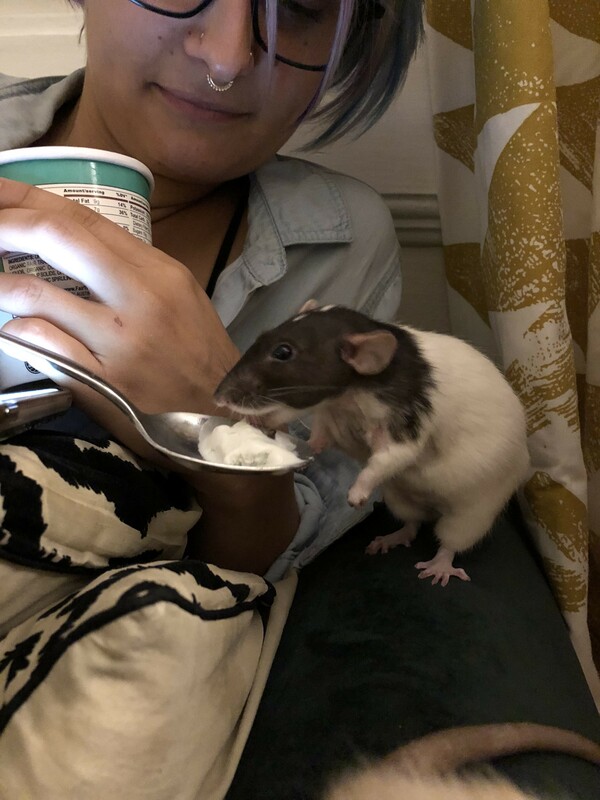 Male rats are considered to be lazier and cuddlier and are generally 30-40% larger than females, further adding to the cuddle factor. 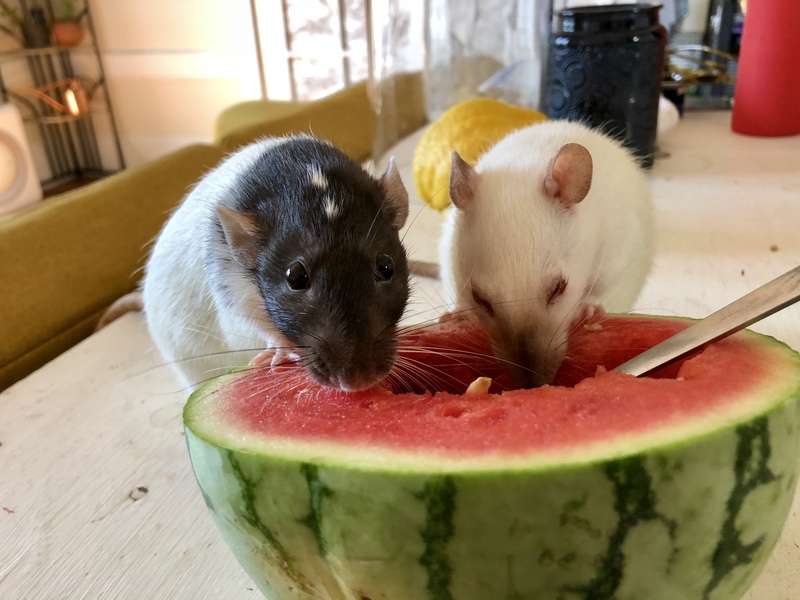 Although they are chilled out towards humans, male rats may be harder to introduce as adults, or may fight with other males after reaching maturity. One unfortunate feature of female rats is their increased likelihood of mammary tumors. These usually occur around 18 months of age or older. About 50% of female rats will have one or several during their life, either at the same time or one after the other. Males can also get mammary tumors, although it is rare – 5%. Spaying female rats can bring their risk down to a similarly low level, also reduces their risk of pituitary tumors and can extend their life. Most mammary tumors are benign, but they grow rapidly and to great sizes that cause harm to the rat through discomfort, impaired mobility and other issues. Fantasia developed a mammary tumor, which first appeared as a tiny mass that grew over weeks. I knew how common this type of growth was and that it was most likely benign. Due to her young age, her vet was worried that her tumors would recur, even with spaying, but we proceeded with a spay and tumor removal. Fantasia healed exceptionally well! As the vet suspected, Fantasia developed another mammary tumor a few months later, which grew rapidly and also required removal. Owning rats can sometimes be a difficult and expensive journey. Despite some bumps in the road, life with Fantasia has been wonderful. I love coming home to her and am filled with joy and love for the little bug who brings so much happiness into my life. Rattie Ratz is an all-volunteer organization whose mission is to help all domesticated ratties who come to us find a loving, forever home. If you would like to know more about Rattie Ratz Rescue you can visit their Facebook page. If you are interested in adoptable rats or volunteering for Rattie Ratz Rescue you can visit their website: www.rattieratz.com. Alyssa Blake Nader is a writer and mental health professional living in the Bay Area. 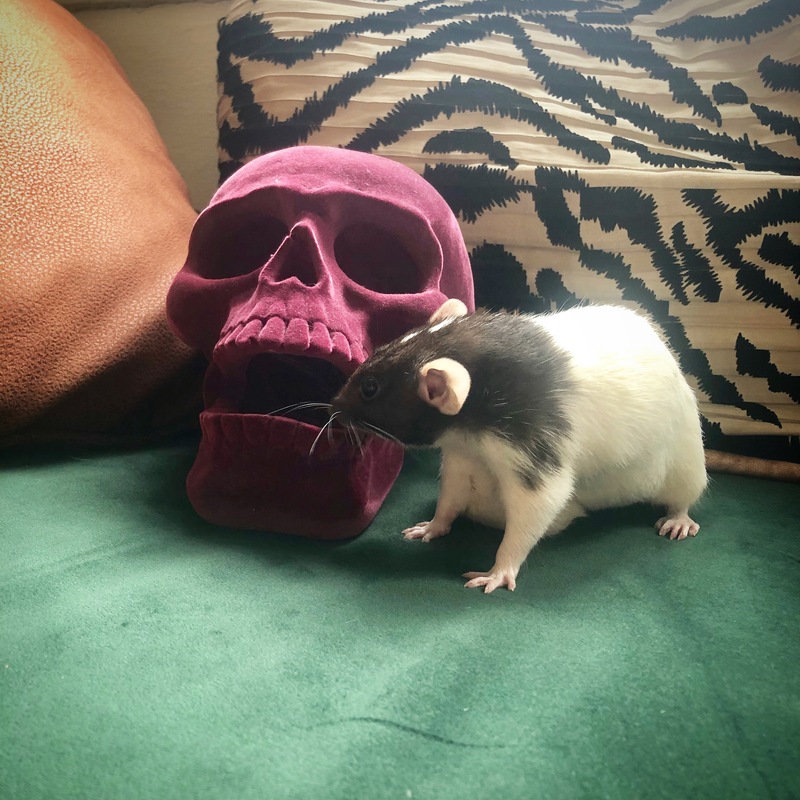 She is new to the rat community and mother to two rat brothers named Bitey and Pablo. In her free time, she enjoys creating art, improve performance, dancing to techno, and bothering everyone about rats.